NETWORK FINALS: PREMIER BOXING gained 0.1 in final numbers, while RANSOM and the rerun of CHICAGO FIRE lost the same. CABLE HIGHLIGHTS: The Saturday Top 5 was heavy on ESPN’s COLLEGE BASKETBALL, with the primetime Duke vs. North Carolina game far in the lead at 1.23. Although it’s a theatrical movie and not an original, whatever HBO thinks, we’ll note that the network’s premiere of X-MEN: APOCALYPSE was cleverly timed to coincide with the arrival of LOGAN in theaters, and justified that with a 0.75 rating for its initial airing. The Adult Swim late-night line-up fared as follows: DRAGON BALL Z up 0.12 to 0.52 (but the primetime episode was down 0.07 to 0.33), JOJO’S BIZARRE ADVENTURES steady at 0.43, MOBILE SUIT GUNDAM up 0.02 to 0.41, HUNTER X HUNTER down 0.01 to 0.36/800K, NARUTO up 0.01 to 0.35/745K, ONE PIECE steady at 0.28/587K, and GHOST IN THE SHELL down 0.01 to 0.24/528K. Nickelodeon had another strong Saturday morning with SPONGEBOB down 0.04 to 0.44, and BUNSEN IS A BEAST down 0.02 to 0.35, and Disney Channel’s morning ELENA OF AVALOR was down 0.03 to 0.35, with another episode at 0.25. Fox Sports 1’s UFC PPV PRELIMS was at 0.40. HGTV’s HOUSE HUNTERS RENOVATION was at 0.36. A&E’s LIVE PD was at 0.32. Lifetime’s original movie CUSTODY was at 0.32. 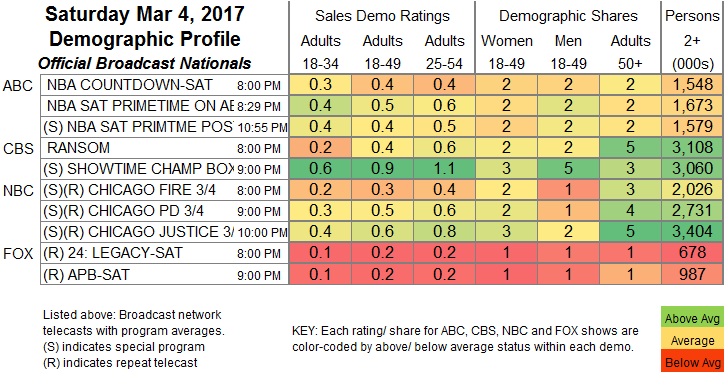 On Food Network, PIONEER WOMAN rose 0.03 to 0.31, KITCHEN AT FN lost 0.05 to 0.24, and VALERIE’S HOME COOKING was down 0.05 to 0.22. On History, COUNTING CARS fell 0.08 to 0.29, and DETROIT STEEL was down 0.06 to 0.20. 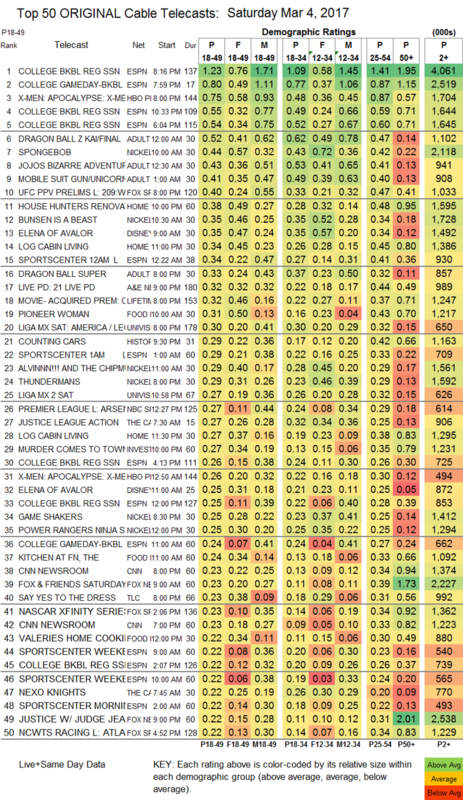 TLC’s SAY YES TO THE DRESS was at 0.23, followed by a UK hour at 0.15. BBCAmerica’s PLANET EARTH II fell 0.06 to 0.20. LOVE THY NEIGHBOR returned to OWN at 0.11/0.10, followed by FOR PEETE’S SAKE at 0.11.